As you'll know if you've read any of my previous blogs about this series of races, the Joydens Wood 5k series is hosted by Dartford Road Runners and takes place on the last Wednesday of May, June and July. 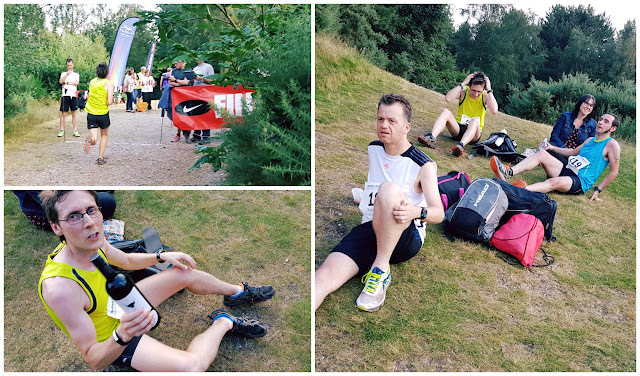 There are three different courses in use but I had only ever run on one of these courses (previous Joydens Wood blogs: 2014 Race 3 / 2015 Race 1 / 2016 Race 2). So I was quite excited to finally get to try out a different course, which for this event happened to be the original Joydens Wood 5k course. This course sticks to the main pathways through the woods which are generally quite gravelly underfoot and the terrain is undulating/hilly. The third and final Joydens Wood 5k of the 2016 series was also the 4th race of the 2016 Run>Dartford series, which is my main racing focus at the moment. I have completed all of the races in the series so far (Links: Dartford Heath 5k / Central Park 4 Mile / Darenth Country Park 2 Mile Relay) and am in a good position in the overall standings, which are decided on age grading rather than absolute time or position. The race opens with a long downhill section on quite an uneven path and then continues to go up and down the hills through the woods. There was one particularly steep incline at around the 2.3km mark and if you look at my GPS data on Strava you can see my pace plummet, but the elevation profile graph doesn't show the hill. However, it had recorded a brief spot where the gradient reached over 10%. The final kilometre includes the infamous 'Mount Misery' (or just 'Misery') which varies between 7% and 11% incline for a good few hundred metres. It's a tough way to finish a 5k but these features of the woods are what make it such a great place to run, and in turn make the Joydens Wood series such a great event to be part of. In the previous month's race of the Joydens Wood series I had a particularly bad time with the hills, so I was pleased that I finished this race 28 seconds faster (although difficult to compare directly as they were run on different courses). I crossed the line in 22.04 (2 minutes slower than flat 5k time is about right) and reached out to take my finishing token (reminder, this is not parkrun!) but instead had the 20th position spot prize, a bottle of wine, placed firmly in my hands instead. As far as the Run>Dartford series goes, that 22.04 finishing time gave me an age-grading of 61.40% which translated into 61.4 points towards my tally in the competition. I'm now on 254 points and this leaves me in 5th position on the consolidated points table with one race, the Thames River Path 10k, left to go.